On July 16, 2018, Kaohsiung Customs seized some smuggled dried mushrooms and dried mushroom shreds which had been concealed in a container. An estimation indicated that there were about 10,000 kilograms of the smuggled goods with a market value around NT$15 million in total. 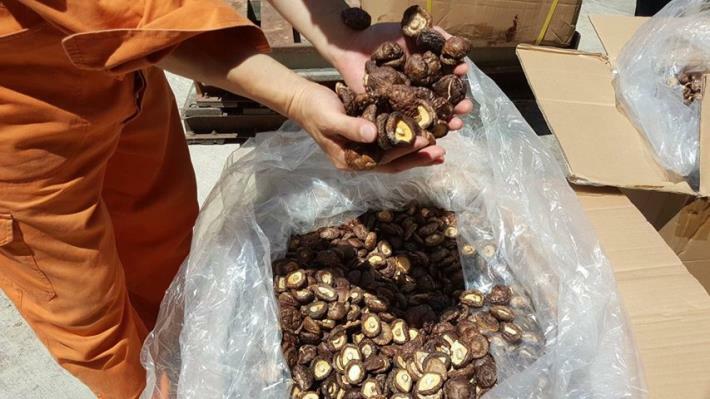 Kaohsiung Customs managed to seize the concealed dried mushrooms without receiving any prior confidential report of smuggling. Some officers were screening manifests, as required by the risk management procedures, when a 40' container of goods imported from Bangkok Port, Thailand via the vessel Wan Hai 165 was found to be suspicious. After the containerized goods, declared as Dried Black Fungus, had been unloaded at Kaohsiung port, an inspection revealed that the first two rows of goods in the container conformed with the declaration; however, the goods from the third row onwards were dried mushrooms and dried mushroom shreds, which had not been listed in the manifest. Consequently, all of the smuggled goods were detained as detailed by the Customs Anti-smuggling Act, and the case was transferred to corresponding judicial authorities for further legal actions. Mr. Chin-Piao Chen, Director of Kaohsiung Customs, said that the goods in question had been imported as the Ghost Festival was just around the corner, boosting the demand for such food ingredients as dried mushrooms. It was inferred that unscrupulous vendors had been tempted to smuggle dried mushrooms to take advantage of the occasion. The Customs authority reiterated that if dried mushrooms which have not been quarantined are sold in the market, the health of the general public will be in jeopardy. Citizens should not buy low-priced dried mushrooms with unclear origins in order to protect their own health. Meanwhile, the public is encouraged to report any suspected smuggling activities to Customs by calling the toll-free number: 0800-711117.